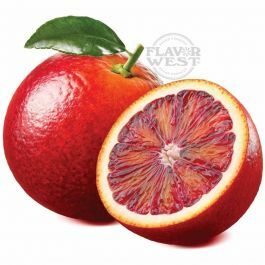 Natural blood orange flavor is made from a typical orange crimson. This flavor offers sweet and intense aroma with a hint of raspberry. Natural blood orange flavoring performs exceptionally in drinks, candy and pastries. It leaves a long-lasting taste in your mouth. It's bloody good. Please Note: Flavor is highly concentrated (Shake well before use). Type: Blood Orange All Natural Water Soluble Flavoring. Ingredients: Natural Flavoring, Propylene Glycol and Ethanol. USP Kosher Grade Flavoring. Usage Rate: 15-20% for E-use. Flavor suitability: beverages, candy flavoring, pastries, baking, flavoring lip balm & more. Specific Gravity: .97 No Refunds on Flavoring. This one isn't something that I'd ever use as a stand alone eLiquid, but it is used in several of my recipes as a finisher. So tasty!